but I have to say that Japan does its aquariums very well. 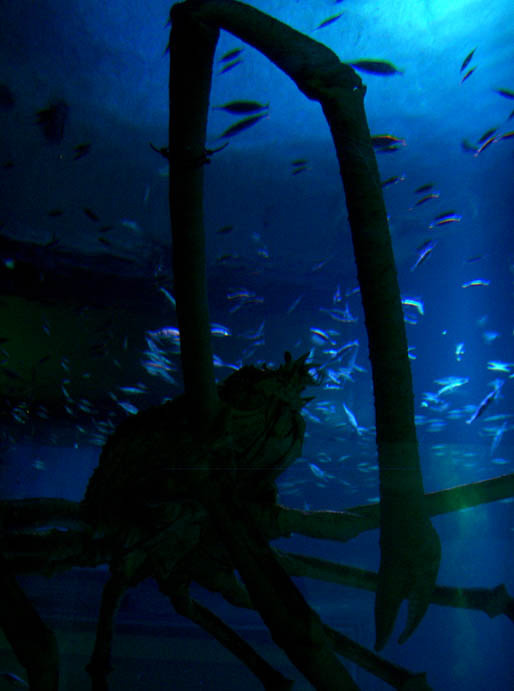 Among the aquariums I have visited in Japan, Osaka Kaiyukan ranks among my favorites. Kagoshima City aquarium is also very well done, and located right across from the still-active volcano, Sakura-jima, which sits in the middle of Kagoshima Bay (my favorite exhibit was the electric eel tank where the voltometer, mounted above the tank, measured the electric discharge that the eel uses to stun its prey during feeding time). My other favorite aquarium is in Okinawa, the Churaumi Aquarium. If you happen to go diving and miss out on seeing giant mantas and whale sharks, you can head over here and see them no problem. In fact, you can see whale sharks (not the largest specimens, but still quite impressive) at all three of these exhibits. One thing I did notice is that 5 years ago, Osaka had a pair of whale sharks, but now there is only one. I wonder what happened to the other one. Coming To Our Senses, Eh? The Canadians seem to be doing something right with one of their waste disposal programs. Using indicators that were traditionally ignored, meaning indicators other than straight economic data, to measure the benefits of their program (and factoring in quantified costs extrapolated from externalities) is a great leap forward on how we measure our environmental and social impacts. I never really thought I’d see any progress in North America for a long time (regarding applied sustainability theory- we always had examples from the small community level that we’d study and discuss- rarely something really big in scale as this), but am happy that the theory and ideas that I studied back in my Environmental Studies classes in Santa Barbara are actually being successfully implemented on a large scale. One of my favorite parts from this article states that the community had a large part in making the program work. Seeing what this community has done together is inspiring. Posted on September 14, 2004 Author AdamCategories Uncategorized1 Comment on Coming To Our Senses, Eh? Fried chikuwa (fish cake) in curry (yello) and aonori (green) batter. Beansprout, carrot, and cucumber salad. Chicken based soup with carrots and gobo (burdock root). Gohan (rice) with an umeboshi (pickled plum). 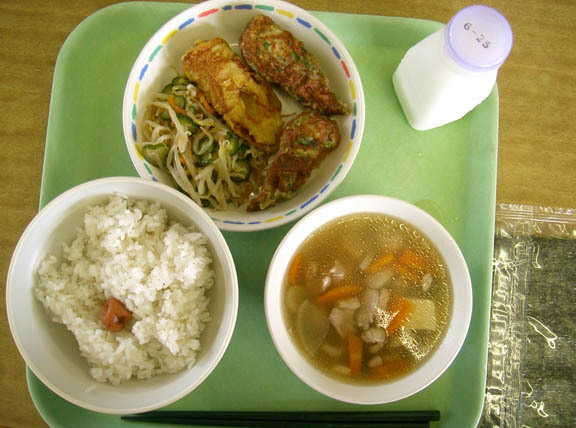 In Japanese schools, ranging from hoikuen (nursery school) to chugakko (junior high school), children are usually provided with meals called kyushoku. Depending on where the school is located, kyushoku can range from factory produced pre-packaged slop (a usual complaint of city JETs) to locally produced balanced and healthy meals. Luckily, my school fell in the second category and I decided to document what I ate at school on the 13 separate occasions that I remembered to take pictures at lunch. These Kyushoku were made by women who live in Ubuyama and planned out by the nutritionist, Mrs. Umei. All of the meals are carefully planned out to provide a balance of protein, carbohydrates, vitamins, minerals, fiber, and other important dietary components. When I first started eating kyushoku I could only finish half of the meals and had to take the rest home. It is commonly observed that teachers gain weight after being transfered to Ubuyama because of the size of the servings (this is a matter of meal size, not of meal content). It is interesting to note that the Japanese school system started encouraging the students to incorporate new things into their diet after the U.S. occupation. Milk, bread, and meat products were uncommon if not completely absent before the end of the war in the Pacific. All of the old people I have talked to about this tend to agree: the Japanese started to grow bigger with the change in diet, and today’s Japanese youths are some pretty big and healthy kids. If you don’t believe me go to any high school’s judo practice and then see what you think. Note: Every day, milk is included as part of a balanced meal. The milk is produced and packaged locally in Ubuyama. Be sure to check out School of Rice, a new site authored by me and my brother. It will chronicle some of the riced out rides that we happen upon and other things that fit under the paradigm of the School of Rice.